This dish may be super quick and easy but it doesn't skip on flavour. This supper is perfect as a starter or as a light meal. Heat a heavy-based pan over a medium heat. The chorizo will release plenty of its own oil so you don't need to add any extra. Add the chorizo to the hot pan and fry for about 1 minute on each side, until the slices are crisp and nicely browned. 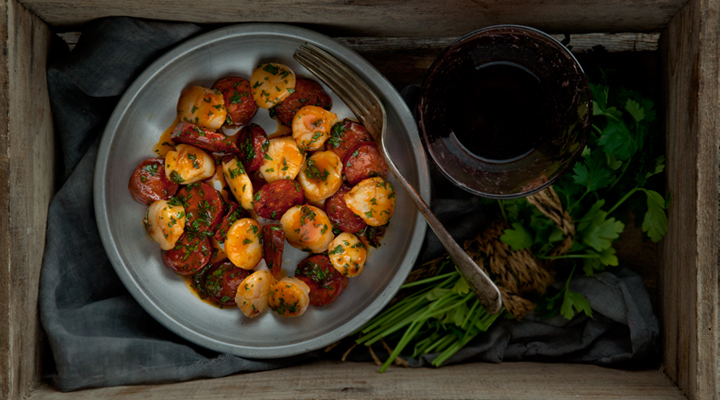 Remove the chorizo to a bowl with a slotted spoon and fry the scallops in the chorizo oil for about 1 minute on each side. Don't overcook the scallops or they will become rubbery and tough. Return the chorizo to the pan with the scallops. Squeeze over the lemon juice and let it bubble up, stirring to coat the chorizo and scallops in the juice. Season with a small pinch of salt and pepper, but you don't need much salt, if any, because the chorizo is already quite salty. Tip out onto a serving platter and sprinkle with the parsley. Serve with some crusty bread to mop up all the juices.